On Friday 31st August, CHC’s Summer Intern programme for 2019 concluded with our interns presenting their work placement deliverables to the CHC team. We wish our interns all the best in their future studies and we are happy to have convinced them of a future rewarding career in the oil and gas industry! 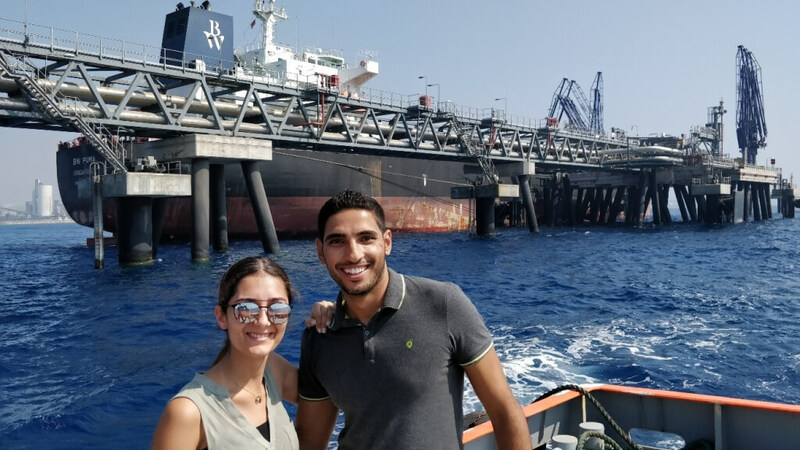 As part of CHC’s ongoing commitment to contributing positively to the development of the oil and gas industry in Cyprus, this summer saw the first formal CHC Summer Internship program being launched, following on form a short trial in 2017. Two positions were announced, for a Commercial and an Engineering Intern, and numerous applications were received from both Cyprus and a number of European countries. The two successful candidates were selected following shortlisting and interviews, and joined CHC at the beginning of July for a two-month period. During this period our interns have been mentored by Nicodemos Nicodemou and Athos Kleanthous respectively for the Engineering and Commercial internships. Both our Engineering Intern, Maria Panayi, and our Commercial Intern, Kyrillos Sehata, have made positive contributions to CHC’s efforts over the past two months. To find out more about their experiences in their own words continue reading below. CHC’s summer interns, Maria and Kyrillos, completed their 2-month placement last week. We asked them to share their thoughts on their experience with CHC, and also tell a little bit more about themselves. Where are you currently studying? What Degree? I just finished my Bsc in Chemical Engineering this year, at the University of Groningen in the Netherlands. I’m starting my Masters in Petroleum Engineering in September at the University of Aberdeen, Scotland. What type of work did you do during your Internship? Did you have a specific project? During these two months at CHC I worked towards creating an Excel-based tool to calculate pressure drop in hydrocarbon-carrying pipelines. The aim of this task was to build a tool which will allow users to input design parameters and natural gas composition for a specific pipeline and calculate the outlet pressure of the system. How is being an intern is different than being a student? Overall, being an intern is very different to being a student, but there are still some similarities. During these two months I had to go back to books and carry a literature study on different aspects of flow hydraulics, distinguish between different methods, find weaknesses of each and make sure I understand the topic in depth. That’s something I was doing very often during my studies. However, when it comes to application of this knowledge gained from the literature study, I now understand how all the principles I was taught at the university can be used to approach real world problems. During execution of the task I had to find several alternative solutions towards arising problems, think of what is a better way to approach a problem and work for the improved result. I started thinking more practically rather than theoretically, and began to consider the principles behind theory, wondering if they made sense before accepting their usefulness. What has been the most surprising aspect of the internship so far? How one can use fundamental principles in combination with approximations, rules of thumb and empirical rules to simulate something at such a large scale, such as the design of a cross-country natural gas pipeline. What are 2 things people might be surprised to know about you? The idea of getting an Engineering degree was frightening to me. Everyone was talking about complicated mathematics, long formulas, physics, mechanics and a complicated life. I feel glad I went against any doubts and fears and pursued my dream! In reality engineering is more fun than it seems! I decided to go alone to the Netherlands for three years. I didn’t know anyone there, I had no friends or someone I knew in the whole country, everything was so different from Cyprus, but still I would not change a minute of it! Any final words of advice for students considering an internship? Go for it! Ask and learn as many things you can! Ask for more things to do, if you believe something is interesting find more about it! And make sure you make most of it! I am Currently studying Mechanical Engineering with a specialization in Oil and Gas at Frederick University in Cyprus. I am in my fourth and final year of a BSc degree. During my internship I created an excel tool modelling the Egyptian Gas market, which can be updated by CHC in order to provide an up-to date view of the gas market in Egypt. Initially, my focus was to understand the dynamics of the Egyptian market based on a supply and demand balance. After achieving this, and supported by CHC’s Commercial Department, I utilized my analytical skills to develop a model that allows the user to record and graphically illustrate the Supply & Demand Balance of Egypt. From my point of view, being an intern and working with real situations is completely different from what we have learned at University. Personally, CHC made me feel a sense of responsibility beyond my internship, which is only two months long. A summer internship gives you the opportunity to understand the difference between the theory that you have learned at school and the real-world applications to the oil and gas industry. So far, my internship has helped me find out which field I would like to study in more detail in a Master’s degree. So far the most surprising aspect of the internship was the day trip to the Vasilikos Area, to visit both the EAC power station and the area of the Hydrocarbons Masterplan. I will never forget this day! It was the first opportunity for me to see real-world applications of what we learned at school at such a large scale. I was really excited and it made me feel so lucky to be here. Try to get as much information you can from your internship and create your own view on the field you chose to study. Don’t forget that your colleagues will have plenty of experience in the topics that are of interest to you, so go and ask them and learn from them! I have found CHC’s people very supportive, and, I personally appreciate all the time that I have spent with each one of the team and I tried to learn from them as much as I can.